1. (1) This Act may be called the Aadhaar (Targeted Delivery of Financial and Other Subsidies, Benefits and Services) Act, 2016. (2) It shall extend to the whole of India except the State of Jammu and Kashmir and save as otherwise provided in this Act, it shall also apply to any offence or contravention thereunder committed outside India by any person. (3) It shall come into force on such date as the Central Government may, by notification in the Official Gazette, appoint; and different dates may, be appointed for different provisions of this Act and any reference in any such provision to the commencement of this Act shall be construed as a reference to the commencement of that provision. (x) “subsidy” means any form of aid, support, grant, subvention, or appropriation, in cash or kind, to an individual or a group of individuals and includes such other subsidies as may be notified by the Central Government. 3. (1) Every resident shall be entitled to obtain an Aadhaar number by submitting his demographic information and biometric information by undergoing the process of enrolment: Provided that the Central Government may, from time to time, notify such other category of individuals who may be entitled to obtain an Aadhaar number. (c) the existence of a right to access information, the procedure for making requests for such access, and details of the person or department in-charge to whom such requests can be made. (3) On receipt of the demographic information and biometric information under sub-section (1), the Authority shall, after verifying the information, in such manner as may be specified by regulations, issue an Aadhaar number to such individual. 4. (1) An Aadhaar number, issued to an individual shall not be re-assigned to any other individual. (2) An Aadhaar number shall be a random number and bear no relation to the attributes or identity of the Aadhaar number holder. (3) An Aadhaar number, in physical or electronic form subject to authentication and other conditions, as may be specified by regulations, may be accepted as proof of identity of the Aadhaar number holder for any purpose. Explanation.— For the purposes of this sub-section, the expression “electronic form” shall have the same meaning as assigned to it in clause (r) of sub-section (1) of section 2 of the Information Technology Act, 2000. Special measures for issuance of Aadhaar number to certain category of persons. 5. The Authority shall take special measures to issue Aadhaar number to women, children, senior citizens, persons with disability, unskilled and unorganised workers, nomadic tribes or to such other persons who do not have any permanent dwelling house and such other categories of individuals as may be specified by regulations. 6. The Authority may require Aadhaar number holders to update their demographic information and biometric information, from time to time, in such manner as may be specified by regulations, so as to ensure continued accuracy of their information in the Central Identities Data Repository. 8. (1) The Authority shall perform authentication of the Aadhaar number of an Aadhaar number holder submitted by any requesting entity, in relation to his biometric information or demographic information, subject to such conditions and on payment of such fees and in such manner as may be specified by regulations. (4) The Authority shall respond to an authentication query with a positive, negative or any other appropriate response sharing such identity information excluding any core biometric information. Aadhaar number not evidence of citizenship or domicile, etc. 9. The Aadhaar number or the authentication thereof shall not, by itself, confer any right of, or be proof of, citizenship or domicile in respect of an Aadhaar number holder. 10. The Authority may engage one or more entities to establish and maintain the Central Identities Data Repository and to perform any other functions as may be specified by regulations. 11. (1) The Central Government shall, by notification, establish an Authority to be known as the Unique Identification Authority of India to be responsible for the processes of enrolment and authentication and perform such other functions assigned to it under this Act. (2) The Authority shall be a body corporate by the name aforesaid, having perpetual succession and a common seal, with power, subject to the provisions of this Act, to acquire, hold and dispose of property, both movable and immovable, and to contract, and shall, by the said name, sue or be sued. (3) The head office of the Authority shall be in New Delhi. (4) The Authority may, with the prior approval of the Central Government, establish its offices at other places in India. 12. The Authority shall consist of a Chairperson, appointed on part-time or full- time basis, two part-time Members, and the chief executive officer who shall be MemberSecretary of the Authority, to be appointed by the Central Government. Qualifications for appointment of Chairperson and Members of Authority. 13. The Chairperson and Members of the Authority shall be persons of ability and integrity having experience and knowledge of at least ten years in matters relating to technology, governance, law, development, economics, finance, management, public affairs or administration. Term of office and other conditions of service of Chairperson and Members. Provided that no person shall hold office as the Chairperson or Member after he has attained the age of sixty-five years. (2) The Chairperson and every Member shall, before entering office, make and subscribe to, an oath of office and of secrecy, in such form and in such manner and before such Authority as may be prescribed. (b) be removed from his office in accordance with the provisions of section 15. (4) The salaries and allowances payable to, and the other terms and conditions of service of, the Chairperson and allowances or remuneration payable to part-time Members shall be such as may be prescribed. Removal of Chairperson and Members. (2) The Chairperson or a Member shall not be removed under clause (b), clause (d) or clause (e) of sub-section (1) unless he has been given a reasonable opportunity of being heard. Restrictions on Chairperson or Members on employment after cessation of office. (d) enter, for a period of three years from his last day in office, into a contract of service with, accept an appointment to a board of directors of, or accept an offer of employment with, an entity with which he had direct and significant official dealings during his term of office. 17. The Chairperson shall preside over the meetings of the Authority, and without prejudice to any provision of this Act, exercise and discharge such other powers and functions of the Authority as may be prescribed. 18. (1) There shall be a chief executive officer of the Authority, not below the rank of Additional Secretary to the Government of India, to be appointed by the Central Government. (e) performing such other functions, or exercising such other powers, as may be specified by regulations. (4) The chief executive officer shall have administrative control over the officers and other employees of the Authority. 19. (1) The Authority shall meet at such times and places and shall observe such rules of procedure in regard to the transaction of business at its meetings, including quorum at such meetings, as may be specified by regulations. (2) The Chairperson, or, if for any reason, he is unable to attend a meeting of the Authority, the senior most Member shall preside over the meetings of the Authority. (3) All questions which come up before any meeting of the Authority shall be decided by a majority of votes by the Members present and voting and in the event of an equality of votes, the Chairperson or in his absence the presiding Member shall have a casting vote. (4) All decisions of the Authority shall be signed by the Chairperson or any other Member or the Member-Secretary authorised by the Authority in this behalf. (5) If any Member, who is a director of a company and who as such director, has any direct or indirect pecuniary interest in any manner coming up for consideration at a meeting of the Authority, he shall, as soon as possible after relevant circumstances have come to his knowledge, disclose the nature of his interest at such meeting and such disclosure shall be recorded in the proceedings of the Authority, and the Member shall not take part in any deliberation or decision of the Authority with respect to that matter. Officers and other employees of Authority. 21. (1) The Authority may, with the approval of the Central Government, determine the number, nature and categories of other officers and employees required by the Authority in the discharge of its functions. (2) The salaries and allowances payable to, and the other terms and conditions of service of, the chief executive officer and other officers and other employees of the Authority shall be such as may be specified by regulations with the approval of the Central Government. (a) all the assets and liabilities of the Unique Identification Authority of India, established vide notification of the Government of India in the Planning Commission number A-43011/02/2009-Admin. I, dated the 28th January, 2009, shall stand transferred to, and vested in, the Authority. (d) all suits and other legal proceedings instituted or which could have been instituted by or against such Unique Identification Authority of India immediately before that day may be continued or may be instituted by or against the Authority. Powers and functions of Authority. 23. (1) The Authority shall develop the policy, procedure and systems for issuing Aadhaar numbers to individuals and perform authentication thereof under this Act. (t) such other powers and functions as may be prescribed. as may be necessary for the purposes of this Act. (4) The Authority may engage such consultants, advisors and other persons as may be required for efficient discharge of its functions under this Act on such allowances or remuneration and terms and conditions as may be specified by contract. 24. The Central Government may, after due appropriation made by Parliament by law in this behalf, make to the Authority, grants of such sums of money as the Central Government may think fit for being utilised for the purposes of this Act. 25. The fees or revenue collected by the Authority shall be credited to the Consolidated Fund of India. 26. (1) The Authority shall maintain proper accounts and other relevant records and prepare an annual statement of accounts in such form as may be prescribed by the Central Government in consultation with the Comptroller and Auditor-General of India. (2) The accounts of the Authority shall be audited annually by the Comptroller and Auditor-General of India at such intervals as may be specified by him and any expenditure incurred in connection with such audit shall be payable by the Authority to the Comptroller and Auditor-General. (3) The Comptroller and Auditor-General of India and any person appointed by him in connection with the audit the accounts of the Authority under this Act shall have the same rights and privileges and authority in connection with such audit as the Comptroller and Auditor-General generally has in connection with the audit of Government accounts, and in particular, shall have the right to demand production of books, accounts, connected vouchers and other documents and papers, and to inspect any of the offices of the Authority. (4) The accounts of the Authority, as certified by the Comptroller and Auditor-General of India or any other person appointed by him in this behalf, together with the audit report thereon shall be forwarded annually to the Central Government by the Authority and the Central Government shall cause the audit report to be laid, as soon as may be after it is received, before each House of Parliament. Returns and annual report, etc. 27. (1) The Authority shall furnish to the Central Government at such time and in such form and manner as may be prescribed or as the Central Government may direct, such returns and statements and particulars in regard to any matter under the jurisdiction of the Authority, as the Central Government may from time to time require. (c) the programmes of work for coming year. (3) A copy of the report received under sub-section (2) shall be laid by the Central Government, as soon as may be after it is received, before each House of Parliament. Security and confidentiality of information. 28. (1) The Authority shall ensure the security of identity information and authentication records of individuals. (3) The Authority shall take all necessary measures to ensure that the information in the possession or control of the Authority, including information stored in the Central Identities Data Repository, is secured and protected against access, use or disclosure not permitted under this Act or regulations made thereunder, and against accidental or intentional destruction, loss or damage. (c) ensure that the agreements or arrangements entered into with such agencies, consultants, advisors or other persons, impose obligations equivalent to those imposed on the Authority under this Act, and require such agencies, consultants, advisors and other persons to act only on instructions from the Authority. Provided that an Aadhaar number holder may request the Authority to provide access to his identity information excluding his core biometric information in such manner as may be specified by regulations. (b) used for any purpose other than generation of Aadhaar numbers and authentication under this Act. (2) The identity information, other than core biometric information, collected or created under this Act may be shared only in accordance with the provisions of this Act and in such manner as may be specified by regulations. (4) No Aadhaar number or core biometric information collected or created under this Act in respect of an Aadhaar number holder shall be published, displayed or posted publicly, except for the purposes as may be specified by regulations. 30. The biometric information collected and stored in electronic form, in accordance with this Act and regulations made thereunder, shall be deemed to be “electronic record” and “sensitive personal data or information”, and the provisions contained in the Information Technology Act, 2000 and the rules made thereunder shall apply to such information, in addition to, and to the extent not in derogation of the provisions of this Act. (c) “sensitive personal data or information” shall have the same meaning as assigned to it in clause (iii) of the Explanation to section 43A of the Information Technology Act, 2000. 31. (1) In case any demographic information of an Aadhaar number holder is found incorrect or changes subsequently, the Aadhaar number holder shall request the Authority to alter such demographic information in his record in the Central Identities Data Repository in such manner as may be specified by regulations. 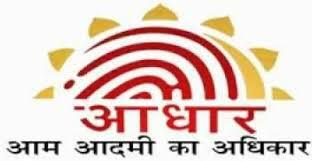 (2) In case any biometric information of Aadhaar number holder is lost or changes subsequently for any reason, the Aadhaar number holder shall request the Authority to make necessary alteration in his record in the Central Identities Data Repository in such manner as may be specified by regulations. (3) On receipt of any request under sub-section (1) or sub-section (2), the Authority may, if it is satisfied, make such alteration as may be required in the record relating to such Aadhaar number holder and intimate such alteration to the concerned Aadhaar number holder. (4) No identity information in the Central Identities Data Repository shall be altered except in the manner provided in this Act or regulations made in this behalf. Access to own information and records of requests for authentication. 32. (1) The Authority shall maintain authentication records in such manner and for such period as may be specified by regulations. (2) Every Aadhaar number holder shall be entitled to obtain his authentication record in such manner as may be specified by regulations. (3) The Authority shall not, either by itself or through any entity under its control, collect, keep or maintain any information about the purpose of authentication. Penalty for impersonation at time of enrolment. 34. Whoever impersonates or attempts to impersonate another person, whether dead or alive, real or imaginary, by providing any false demographic information or biometric information, shall be punishable with imprisonment for a term which may extend to three years or with a fine which may extend to ten thousand rupees or with both. Penalty for impersonation of Aadhaar number holder by changing demographic information or biometric information. 35. Whoever, with the intention of causing harm or mischief to an Aadhaar number holder, or with the intention of appropriating the identity of an Aadhaar number holder changes or attempts to change any demographic information or biometric information of an Aadhaar number holder by impersonating or attempting to impersonate another person, dead or alive, real or imaginary, shall be punishable with imprisonment for a term which may extend to three years and shall also be liable to a fine which may extend to ten thousand rupees. 36. Whoever, not being authorised to collect identity information under the provisions of this Act, by words, conduct or demeanour pretends that he is authorised to do so, shall be punishable with imprisonment for a term which may extend to three years or with a fine which may extend to ten thousand rupees or, in the case of a company, with a fine which may extend to one lakh rupees or with both. 37. Whoever, intentionally discloses, transmits, copies or otherwise disseminates any identity information collected in the course of enrolment or authentication to any person not authorised under this Act or regulations made thereunder or in contravention of any agreement or arrangement entered into pursuant to the provisions of this Act, shall be punishable with imprisonment for a term which may extend to three years or with a fine which may extend to ten thousand rupees or, in the case of a company, with a fine which may extend to one lakh rupees or with both. shall be punishable with imprisonment for a term which may extend to three years and shall also be liable to a fine which shall not be less than ten lakh rupees. Penalty for tampering with data in Central Identities Data Repository. 39. Whoever, not being authorised by the Authority, uses or tampers with the data in the Central Identities Data Repository or in any removable storage medium with the intent of modifying information relating to Aadhaar number holder or discovering any information thereof, shall be punishable with imprisonment for a term which may extend to three years and shall also be liable to a fine which may extend to ten thousand rupees. Penalty for unauthorised use by requesting entity. 40. Whoever, being a requesting entity, uses the identity information of an individual in contravention of sub-section (3) of section 8, shall be punishable with imprisonment which may extend to three years or with a fine which may extend to ten thousand rupees or, in the case of a company, with a fine which may extend to one lakh rupees or with both. Penalty for noncompliance with intimation requirements. 41. Whoever, being an enrolling agency or a requesting entity, fails to comply with the requirements of sub-section (2) of section 3 or sub-section (3) of section 8, shall be punishable with imprisonment which may extend to one year or with a fine which may extend to ten thousand rupees or, in the case of a company, with a fine which may extend to one lakh rupees or with both. Provided that nothing contained in this sub-section shall render any such person liable to any punishment provided in this Act if he proves that the offence was committed without his knowledge or that he had exercised all due diligence to prevent the commission of such offence. (2) Notwithstanding anything contained in sub-section (1), where any offence under this Act has been committed by a company and it is proved that the offence has been committed with the consent or connivance of, or is attributable to, any neglect on the part of any director, manager, secretary or other officer of the company, such director, manager, secretary or other officer shall also be deemed to be guilty of the offence and shall be liable to be proceeded against and punished accordingly. 44. (1) Subject to the provisions of sub-section (2), the provisions of this Act shall apply also to any offence or contravention committed outside India by any person, irrespective of his nationality. (2) For the purposes of sub-section (1), the provisions of this Act shall apply to any offence or contravention committed outside India by any person, if the act or conduct constituting the offence or contravention involves any data in the Central Identities Data Repository. Penalties not to interfere with other punishments. 46. No penalty imposed under this Act shall prevent the imposition of any other penalty or punishment under any other law for the time being in force. 47. (1) No court shall take cognizance of any offence punishable under this Act, save on a complaint made by the Authority or any officer or person authorised by it. (2) No court inferior to that of a Chief Metropolitan Magistrate or a Chief Judicial Magistrate shall try any offence punishable under this Act. (c) all properties owned or controlled by the Authority shall, until the Authority is reconstituted under sub-section (3), vest in the Central Government. (3) On or before the expiration of the period of supersession specified in the notification issued under sub-section (1), the Central Government shall reconstitute the Authority by a fresh appointment of its Chairperson and other Members and in such case any person who had vacated his office under clause (a) of sub-section (2) shall not be deemed to be disqualified for reappointment. (4) The Central Government shall cause a copy of the notification issued under sub-section (1) and a full report of any action taken under this section and the circumstances leading to such action to be laid before each House of Parliament at the earliest. Members, officers, etc., to be public servants. 49. The Chairperson, Members, officers and other employees of the Authority shall be deemed, while acting or purporting to act in pursuance of any of the provisions of this Act, to be public servants within the meaning of section 21 of the Indian Penal Code. Power of Central Government to issue directions. 52. No suit, prosecution or other legal proceeding shall lie against the Central Government or the Authority or the Chairperson or any Member or any officer, or other employees of the Authority for anything which is in good faith done or intended to be done under this Act or the rule or regulation made thereunder. 53. (1) The Central Government may, by notification, make rules to carry out the provisions of this Act. (h) any other matter which is required to be, or may be, prescribed, or in respect of which provision is to be or may be made by rules. 54. (1) The Authority may, by notification, make regulations consistent with this Act and the rules made thereunder, for carrying out the provisions of this Act. (x) any other matter which is required to be, or may be, specified, or in respect of which provision is to be or may be made by regulations. 55. Every rule and every regulation made under this Act shall be laid, as soon as may be after it is made, before each House of Parliament, while it is in session, for a total period of thirty days which may be comprised in one session or in two or more successive sessions, and if, before the expiry of the session immediately following the session or the successive sessions aforesaid, both Houses agree in making any modification in the rule or regulation, or both the Houses agree that the rule or regulation should not be made, the rule or regulation shall thereafter have effect only in such modified form or be of no effect, as the case may be; so, however, that any such modification or annulment shall be without prejudice to the validity of anything previously done under that rule or regulation. 56. The provisions of this Act shall be in addition to, and not in derogation of, any other law for the time being in force. 59. Anything done or any action taken by the Central Government under the Resolution of the Government of India, Planning Commission bearing notification number A-43011/02/2009-Admin. I, dated the 28th January, 2009, or by the Department of Electronics and Information Technology under the Cabinet Secretariat Notification bearing notification number S.O. 2492(E), dated the 12th September, 2015, as the case may be, shall be deemed to have been validly done or taken under this Act. Additional Secy. to the Govt. of India.